Triple Action Balm, 100% natural, against moisture and associated bacterial and fungal complications. Water resistant, it offers an effective and long-lasting skin protection against external aggressions while soothing and nourishing, whatever the weather. The skin breathes and quickly becomes healthy and supple again. The hair repels smooth and shiny. 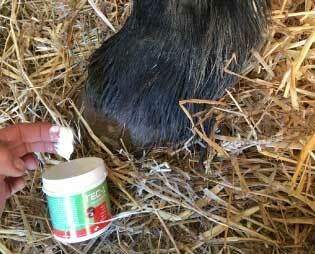 TEC-1 offers an effective protection against winter problems related to humidity, on the limbs or other areas of the body (head, ears, back, belly ..). It can prevent or stop epidermal damage caused by excessive moisture (sodden soils, mud, dew) or external irritants (urine, ammonia vapors, contaminated soils). 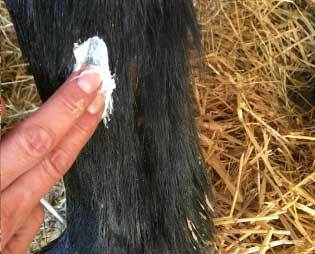 Its thick, non-sticky texture allows an easy and effective application on depilated areas or on short-haired areas such as the pastern. TEC-1 balm creates a supple and water resistant film on the surface of the skin, protecting it from external aggressions such as moisture or urine, and helps the skin to protect itself from associated bacterial and fungal complications. Non-sticky and breathable, it supports the natural elasticity of the skin and preserves skin cell physiology thanks to its relipidants and antioxidants. TEC-1 contains soothing and highly nutritious active ingredients that penetrate quickly into the epidermis for immediate and lasting relief and skin support. Day after day, the epidermis is strengthened and restores its integrity.